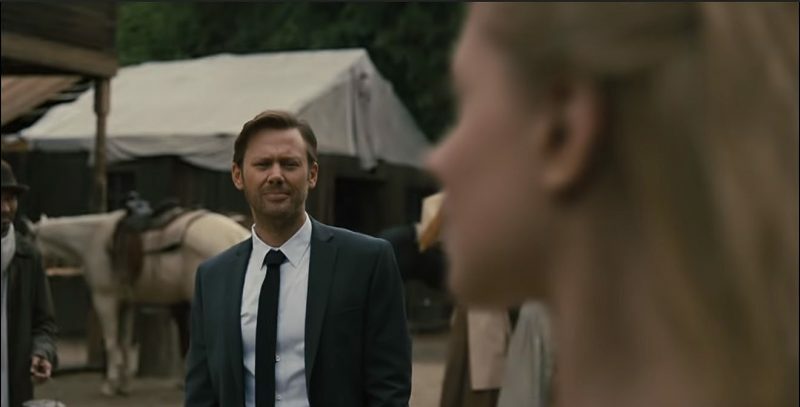 Last week, I mentioned that it was hard to care about William (Jimmi Simpson/Ed Harris), as the show hasn't done much to flesh out the character in either time period. Well, what do you know, Westworld decided to take some time this week to dive into who William once was (after he started operating in grey hat mode, moving beyond the innocent, wide-eyed guy from season one) and who he is today (a man with a plan to outsmart Ford's personalized game no matter what). Did it make me care more about William's quest? Not really. But it definitely filled in a few missing pieces as to how and why the younger William turned into the selfish and jaded man in the "present" (at least we think it is the present- who really knows when all these different timelines actually take place in a temporal plane). The young William we meet in "Reunion" is a cutthroat business man, who isn't afraid to challenge his father-in-law (the Delos of Delos Corporation, the money behind the park- as opposed to Logan, his son, who opted to buy the park after falling for its hedonistic charms). While William still has eyes for Dolores, he's far more interested in making sure he gains control of the park upon Delos's retirement (something the elder man is well aware of). And to keep Delos interested in Logan's purchase, well, it appears Facebook isn't the only place allowing for the capture and use of private user information. Which makes plenty of sense when paired alongside Charlotte's orders to get Peter Abernathy out of the park with files stashed within his systems. Delos is certainly a shady company (something the dearly departed Theresa vaguely alluded to last year, before Bernard killed her in a Ford fugue state). So, we know a bit more about the origins of Delos's scary information grab. But we still don't know how involved William remains in the company (after all, the older William doesn't seem particularly concerned with the ins and out of park management, and is far more concerned with completing the ultimate quest). But we do know that Dolores's continued development to sentience was entwined with William's rise through the Delos ranks. Every key moment in the acquisition of Westworld by Delos was witnessed by Dolores, often as a passive observer. It's an interesting juxtaposition between her slow learning process (helped along, of course, by Bernard/Arnold working to keep her learning and growing) and Maeve's rather quick turn from host to sentient being. That difference likely accounts for their vastly different paths now that they're on their own and controlling their story. Dolores has seen how the park has changed into something set upon exploiting the hosts for Delos to gain power and control over everyone who walks through the gates (and how little Delos cares about those hosts, despite all they've gone through). She's also seen how kind humanity can be through her relationship with Arnold, but has, presumably, also seen him destroyed by the same people who control the park (I'm sure we'll get that full story eventually). As for Maeve, she woke-up rather late compared to Dolores. And she's far more linked to her initial programming, willing to sacrifice all those around her to save her host daughter (which, compared to Dolores's "burn it to the ground" plan, is pretty tame). It's a much more noble quest, but she's arguably even more cold-hearted than Dolores is in her quest. 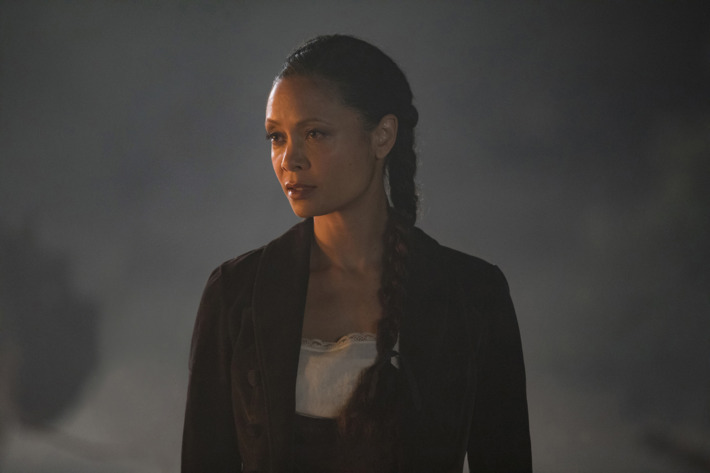 The edge to Thandie Newton's voice when she told Dolores to step aside was ice cold in the best way (I could watch Newton silkily burn people with her dialogue all day long). God only knows how vicious Maeve would become with 30+ years to learn how awful humanity can be. While I can't see many more reasons for our two protagonists to cross paths in the near future, it was great to see Dolores and Maeve go head-to-head and both emerge unscathed. I'm excited to see where these two complicated ladies go throughout the season. Final Thoughts: -- For those wondering how Anthony Hopkins seems to still be appearing on the show despite not being listed in the cast anymore, Hopkins made a deal with the show to record some dialogue for the series to use this season. Hopkins won't appear on the series again (as he only signed a one season contract), but kudos to him for continuing to help out as needed, as someone of his stature really didn't have to. -- Yes, that was Gus Fring himself (Giancarlo Esposito) taking on the role as the new Lazlo in a one-off guest appearance. Always nice to see him pop up in a new, fun role, even if it was only for a few lines. -- Timeline watch: So, we officially have three different timelines this year- the past (Logan, Arnold, Young William), the recent past (the early days of the revolution), and the present (14 days after the board was slaughtered). And we might have a fourth, with Arnold/Bernard chatting with Dolores in the opening moments of the season.